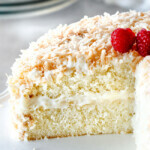 This Coconut Cake is a coconut lover’s dream! It isn’t just a white cake with coconut frosting but is infused with 3 types of coconut for ultimate coconut bliss! This homemade Coconut Cake will be the hit of Easter and every other occasion! Its unbelievably light and tender thanks to a unique Baker’s Illustrated mixing method and is infused with coconut through and through. It’s smothered in a thick cream cheese Coconut Frosting then cocooned in toasted coconut. And the best part is you can make the entire cake beforehand and freeze it, then just pull it out a few hours before serving for stunningly delicious, stress free easy Coconut Cake! Preheat oven to 325 degrees F. Line the bottom of two 9-inch cake pans with parchment paper. Spray with nonstick cooking spray WITH flour or butter and flour pans. Mix the flour, sugar, baking powder and salt in the bowl of a standing mixer at the lowest speed to combine, about 30 seconds. With the mixer still running at the lowest speed, add 1 piece of butter at a time and continue to beat until all the butter is added. Increase speed to medium to medium-high and continue to beat until the mixture resembles coarse meal, with butter bits no larger than small peas (this can take several minutes). With the mixer running on low, add approximately half of the egg mixture to the flour mixture. Increase speed to medium-high and beat until light and fluffy, about 30 seconds. With the mixer still running, add remaining butter mixture. Stop the mixer and scrape down the bowl then continue to beat at medium-high speed to combine, about 15 seconds (batter will be thick). Cool the cakes in the pan on a wire rack for 10 minutes then loosen cakes from the sides of the pan with a butter knife then invert onto a plate or baking pan then invert back onto the cooking rack so the tops sides face up; cool to room temperature before frosting. While the cakes are cooling toast coconut. Increase oven temperature to 350 degrees F.
Add coconut to a large baking sheet/jelly roll pan and spread into an even layer. Bake at 350 F degrees for 5-7 minutes, stirring occasionally and watching closely towards the end as coconut can burn quickly. Using a handheld mixer, beat cream cheese, butter, cream of coconut, coconut extract, vanilla extract and salt at medium speed until very creamy, 1-2 minutes. Gradually add powdered sugar then beat until smooth. If frosting is too thick then you can beat in 1 teaspoon milk at a time until you’ve reached desired consistency. If frosting is too runny, then refrigerate until more set. Place one cake layer on cake stand or serving platter. Top this cake layer with a generous layer of frosting (approximately 1 cup) then place the second cake on top of it. Frost the top and sides of the cake. Press toasted coconut onto the top and sides of the cake. If not serving immediately, frosted cake should be covered with an inverted bowl or cake cover and refrigerated. Bring cake to room temperature before serving. *Cream of coconut is NOT coconut cream. It is sweetened coconut cream that is often used in mixed drinks but does not contain alcohol. You can find it with the mixers at your local grocery store. It is a very common ingredient so if you can’t find it then be sure to ask for some help. **These ingredients MUST be brought to room temperature and NOT microwaved in order for the frosting to be a success and not be runny. If your frosting is runny then you can refrigerate to thicken up before frosting your cake. ****The Cake layers can prepared one day in advance. Let the layers cool completely then wrap each layer tightly in plastic wrap and store in the refrigerator. If you are planning on freezing, then prep/frost your cake on a freezer safe plate/platter. Place frosted Coconut Cake with coconut in the freezer until it is firm to the touch. Once firm, wrap tightly in plastic wrap then repeat with a second layer of plastic wrap. Next wrap tightly in 1-2 layers of foil until completely sealed. If you are freezing individual slices, then place these plastic/foil wrapped slices in a freezer bag. If you are freezing your entire Coconut Cake for an extended period of time, then secure the aluminum foil with freezer tape to prevent freezer burn. You can store your Coconut Cake for up to 4 months. You can also wrap and freeze unfrosted layers of Coconut Cake using the same method and frost when you need them. To thaw your finished Coconut Cake, remove cake from the freezer and carefully remove the plastic and foil. Allow to thaw for about four hours before serving.